I view my sojourn in the United States of America as an orchestration by God to connect me to the Fishermen Ministry (TFM). You would understand why I say that when you read my testimony by clicking here. During the period when I was connected to the TFM I stayed with some of the minister’s in their home as part of the requirements of my discipleship training. I stayed with Steve Atherthon and his family at Northfield falls in Vermont, I also lived with Brother Charles Hocker and his wife Karen at Springfield also in Vermont, then also with Ricky Eutsler and his family in Cottageville, South Carolina. Of course one cannot be in the ministry without experiencing life at the Grace Ranch in Texas where the late general overseer of TFM Brother Richard Eutsler Sr. lived and ministered. Fast forward to my arrival in Ghana in March 2009, I had various opportunities to minister the gospel to many pastors and churches. I used the opportunity to talk to them about how the Lord used the TFM to show me the ways of God in a different way from what I had always known ever since I became born again. Even though the ministry has a strong presence on the World Wide Web www.thefishermenministry.org, many people that I ministered to and referenced the ministry to still yearned to have real contact whom they could relate to. 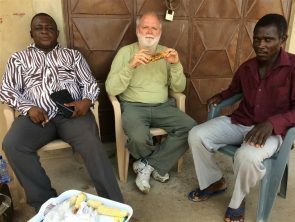 Thanks to God that early this year in April, Brother Steve asked Charles Hocker to visit me in Ghana to firm up fellowship with my family and associates as well as disciples here. 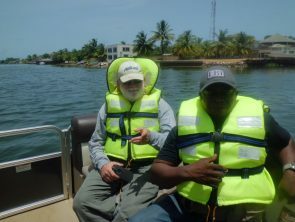 Lawrence and Charles on a cruise on Volta River (click on the image to view more photos). Even though his visit was just two weeks, Charles, had a great experience with my family, brothers and sisters, brother Alexander Vordzorgbe and his family, pastor Padi and the Higher Glory House Ministry congregation amongst many others that he interacted with one way or the other. The itinerary I drafted for him was well packed. It also included travels to the Shai Resource reserve, travel to Aqua Safari Resort in Ada on the eastern Coast where the Volta river estuary is located. Trips were also made to Cape Coast in the central region where we visited the Cape Coast castle built in 1663 and which later became the seat of the British colonial government for the Gold Coast in 1844. We were taken through a guided tour of the place. My son Godson Tsimese and Pastor Padi’s daughter Ruth Padi as well as my niece Emmanuella Tsimese all study at the University of Cape Coast (UCC) and it was just prudent that Charles had to meet and interact with them. Lest I forget, we also went to the eastern regional capital of Koforidua to attend the funeral of a family brother who had passed on shortly before Charles arrived in Ghana. Charles was exposed to Ghanaian climatic conditions, our food, local languages and the crazy vehicular traffic situations. I believe he had a good time. I remember when we visited the Shai Resource Center and entered a cave only to come out to realize it had rained so heavy that the clayey soil was soggy hence making movement/traction by the vehicle very difficult. The 2WD Dodge Caravan couldn’t deal with the situation and we “danced” on the muddy road occasionally stalling. Charles had the unpleasant duty of helping the tour guide push the car with lots of mud soiling his dress and painting his face black from the spinning tires. He took it cool and even thought it was fun contrary to my expectation that he’d react negatively to it. That kind of humility is rare. Brother Charles visits Brother Alex’s residence (click on the above image to see more photos). Towards the last days of his visit, Charles was led to anoint the four pillars of my house, that of pastor Padi and that also of Brother Alexander. He also asked that we hold Bible studies at Brother Alex’s residence with his family as instructed by the Lord. This has been going on ever since notwithstanding that there are problems associated with consistency and non commitment by some members of that family but for the children who remain very committed and encourages the meeting to continue to progress. Charles is fondly remembered by all whom he had interacted with during the visit and I believe that he left a lasting impression on them.